Why isn't my Nexus 7 sideloading? I have a nexus 7 that I tried to downgrade to 4.4.4 from 5.1 and in the process my tablet was wiped. I have no ROM ( I believe ). So I dug around the internet for about 4 days looking for an answer. The only solution I found to work was installing cwm recovery. So now the only two things I can do on my tablet is go into fastboot and cwm recovery. So finally I tried countless times to send the original ROM using sideloader. The files try to run but they get do 100% and then my tablet says "installation aborted". Does anyone know what I should do? 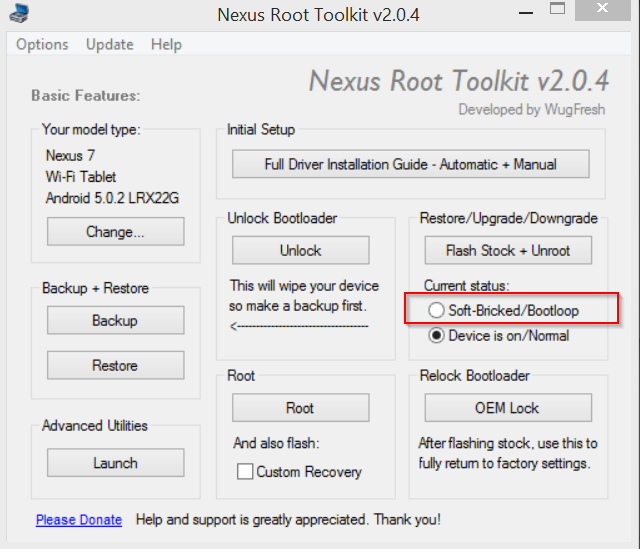 Once you install and open the toolkit, after the initial updates to the toolkit you will want to use the following options in the screenshot below under flash stock + unroot. Follow the prompts and you should be able to select your choice of which version of OS, in your case Android 4.4.4 to flash into. Feel free to stop back and let us know how things go! How do I root my Blu Studio 5.0k? Why did my text messages change to grey (Galaxy 5 phone)? Hi may i know what is the reason my nexus 5 keep restarting?